Finally, MT4 App that protects your Forex trading account from an unexpected drawdown! Have you ever wonder is Forex trading safe and secure? Did you ask yourself how to do safe Forex trading? Every Forex trader knows that it is quite risky to have open positions on your MT4 account while you are away from the computer because you never know when the market price can decline or go in the wrong direction. A moment later your deposit can be lost. Equity Sentry EA is here to solve this problem and be your #1 safe trading app for MT4. Super-charge your MT4 trading platform and trade Forex much safer. Equity Sentry EA is the best MT4 Equity Protection EA for retail Forex traders which can close all open positions and disable all Expert Advisors in specific situations. The primary function of the ESEA is to allow Forex traders set a "Hard Stop" level to protect the account from unexpected drawdowns. Also, it has other additional useful features like "Evergreen Profit Target" and "On Timer Actions." Equity Sentry EA is designed to monitor MT4 account 24/7 and perform specific operations and safety procedures when predefined conditions are met. When market price declines to a particular level ESEA will close all open positions and disable all Expert Advisors even if you use a trading robot which opens new orders immediately after old ones get closed. ESEA will shut down other EAs before closing positions eliminating the chance of any new positions being opened. Equity Sentry EA is probably the only app for MT4 to prevent other EAs from opening new trades after the Hard Stop is triggered. With the ESEA you can keep the drawdown low and not worry that your manager or some Forex trading robot will blow your account. Also, ESEA can monitor not only open positions (floating profit/loss) but also closed trades too. It means ESEA can detect series of closed losing trades automatically and take necessary security actions. Equity Sentry EA is one of the most useful MetaTrader 4 apps because it not only can save your account from an unexpected drawdown but also apply "Evergreen Profit Target" and offer very useful "On Timer" functions to perform various security actions at your desired time. Also, to protect your account from a disaster, ESEA is ready to close all open trades, disable Autotrading, shutdown all EAs by closing all charts or even close MT4 terminal completely. Close open trades & delete pending orders. 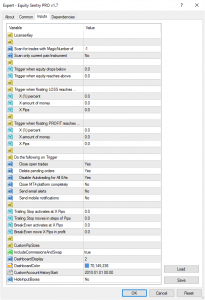 Disable Autotrading on MT4 terminal, which makes all EA‘s to stop any operations and prevent them from opening, modifying or closing any trades on the account. ESEA disables Autotrading in a very simple manner by clicking the „Autotrading“ button programmatically in the top MT4 toolbar. Close other charts together with any trading EAs to eliminate any chance of new trades being opened. ESEA can calculate floating profit/loss in pips, deposit currency or percentage. ESEA can apply Magic Number and currency filters. It means you can set ESEA to manage only the trades of a particular currency pair and magic number. ESEA can apply Trailing Stop and Break Even for each trade individually. All parameters are self-explanatory and easy to understand. Click on the image to see at full size. 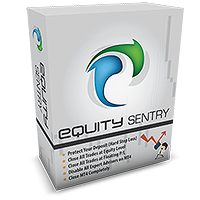 Equity Sentry EA is useful for advanced and beginner Forex traders. Equity Sentry EA is probably the best, and the only choice for protecting your MT4 account from new trades being opened by other EAs in a case of a maximum drawdown reached (even if they open trades immediately when old positions get closed). ESEA is the only safe way to protect your account from new trades from most of the trading robots because ESEA can close all other charts and EAs before closing the trades which leaves no way to open any new trades for any EA. IMPORTANT: The speed of closing Forex positions depends on the speed of your Internet connection and the broker you are using. Note that MT4 works in a way that EA can perform one action at a time which means all trades get closed one by one.